The Big Apple is one of the world’s top vacation destinations for holidaymakers from all over the globe. There are so many attractions and famous sights here that there is enough to keep any tourist occupied for months, however some are more well known than others. Here are some of the best tourist spots to see in New York City. This iconic symbol of New York city, the Statue of Liberty has been in place since 1886 and is the largest statue in the world, with a height of 152 feet. Tourists can tour the monument by taking a short boat trip to Liberty Island and enjoy spectacular views of Manhattan from the top. Tickets have to be bought in advance as they sell out quickly. 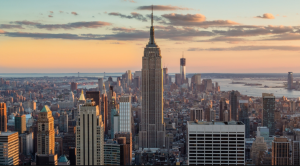 Although no longer the tallest building, the Empire State is still the most famous tourist spot in New York. Opened in 1931, it boasts two observatories and outdoor promenades where tourists can enjoy views of up to 80 miles around. This iconic park in the heart of New York boasts many attractions as well as being an oasis of green in the cityscape. The Central Park Zoo is a major draw for those with children and the Lake is the ideal setting for paddling in summer and ice skating in winter. No trip to New York would be complete without a visit to Broadway to see one of the world famous shows. Known all over the world for high quality musicals and drama, this is a key tourist spot for those who yearn to experience the legendary atmosphere. For keen shoppers, Fifth Avenue is a paradise. Famous all over the world as New York’s premier shopping destination, there is no finer place to window shop or invest in a luxury purchase. Cartier, Tiffanys and Saks are all here making this a must-see spot. Seen in countless TV programs and movies, Times Square is well known for its enormous brightly lit billboards. Home to the world’s first moving sign back in 1928, this area is centrally located for all of New York’s best theaters, restaurants and stores. Famous for its shining spire, the Chrysler building is an instantly recognisable tourist spot. A perfect reflection of art deco architecture, it was once the world’s tallest building. If tourist come to New York expecting to see amazing skyscrapers they should go to Wall Street. Home of the New York Stock Exchange, this area is a tourist mecca stretching over 8 blocks. This enormous entertainment and shopping complex in the heart of Manhattan is also home to NBC-TV. Featuring an outdoor skating rink over the winter months, is is also home to the Top Of The Rock Observation Deck where tourists can see amazing panoramic vistas over the city. Art lovers of all ages should definitely stop by the Metropolitan Museum of Art which was founded here back in 1870. With over 2 million pieces in its permanent collection, it boasts everything from costumes and Egyptian art to to photographs and instruments.